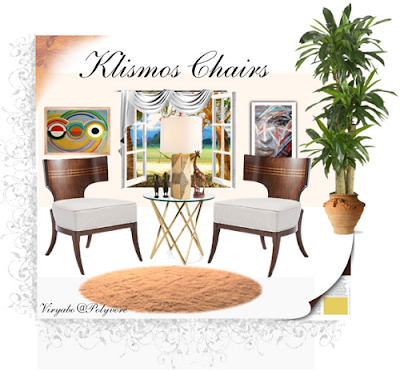 Klismos chairs are accent chairs shaped after representations found on ancient Greek bas relief and pottery designs of the 5th century. If you are looking for classic chairs with clean lines and soft curves that will work perfectly well in any interior setting, modern or traditional, then you’ll love these timeless chairs that have been revived in neoclassic furniture styles. A modern Klismos chair used as an accent chair in this iimage. Notice the curved lines on every part of its strucyure - backrest, seat, stiles, and legs. With ineresting and distinguishing features, the Klismos chair is one unique style among classic seats. Its sabre-like tapering legs, curved tablet backrests and curled stiles gives it a visually light weight appearance and though it look sleek, it is a generously wide chair, a feature evident in its backrest that curves forward enough to rest your elbows. 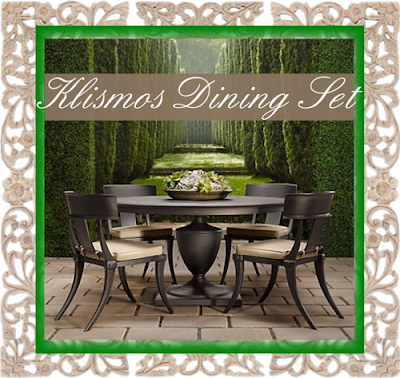 They, no doubt, will add elegance to your dining room. Not only that; they also look quite stylish when you use them as accent chairs. They will transform a lack-lustre living room seating arrangement into a beautiful and stylish setting. Evidence that the style of Klismos chairs date back to the ancient Greeks can be seen in the period depictions on painted pottery and carvings found at the Acropolis of Athens (a world heritage site). And though very few original specimens have been discovered by modern archaeologists, the artworks and carvings excavated give a clear indication of how the chairs must have looked like. The chair's design can be aptly described as “simultaneously old-world and contemporary”, what with its sculptured classic silhouette and whichever way you use it, either in a sophisticated setting or in a more casual setting, people always love the expressive, unique, and completely timeless look of this ancient styled chair. Klismos chairs are popularly used as dining chairs as shown in this setting. However, it can also be used as an occassional chair or as an accent chair. With its age-old lines and characteristic S-curves, it’s a popular choice amongst those who like the elegant neoclassic interior design set-up. Just like many true classics, the Klismos chair design has been reproduced and re-designed hundreds of ways, but even with that, it’s a unique piece of furniture that still maintains a sense of tradition. 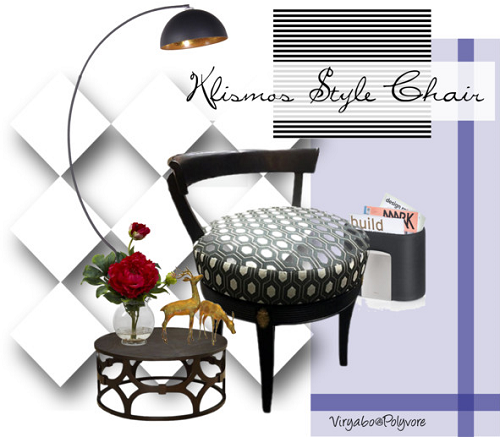 Another Klismos chair design variation. Notice how it still possesses the classic curvature/S shaped features. With its relatively frequent appearance over the centuries, the basic design of the Klismos chair still looks surprisingly consistent. It has been endlessly reinterpreted since as far back as the late 18th century and is the only piece of ancient Greek furniture style that can still be found in modern interiors settings today and made from various materials ranging from wood and faux leather pieces, to acrylic Klismos, leather/wood combo, and rattan. But why is the chair style such an enduring chair and an all time favourite? Probably because its flowing curvy strokes balances its classical sobriety or because the curved back rest makes it so comfortable to sit in while its curved legs offer extra support. And then maybe because they are generally lightweight chairs that can easily be moved around a room from one spot to another. 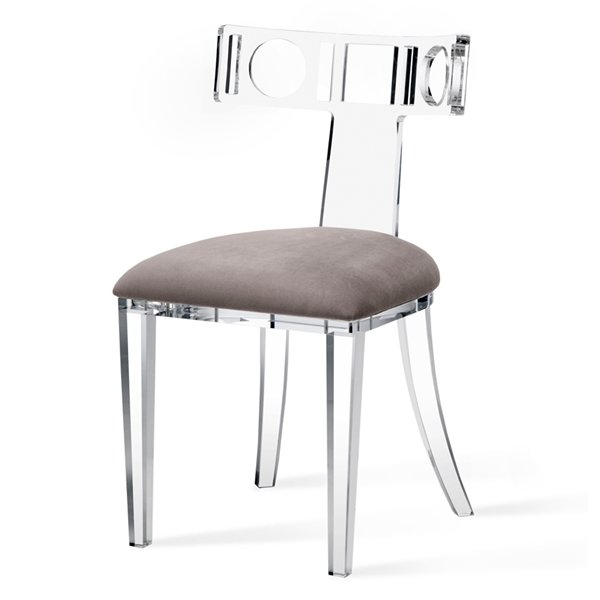 A modern style Klismos chair made in clear acrylic and velvet seat. 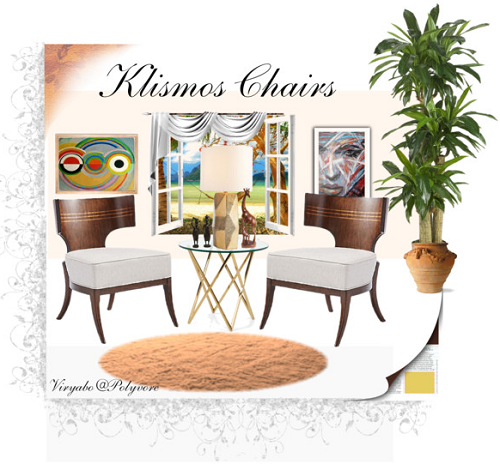 For today’s designers and decorators, the Klismos chairs remains a top choice for accent or dining chairs just for their sheer elegance. Why not? After all it is “literally the only ancient furniture form that, in its most faithful reproduction, can still fulfill today's practical and stylistic requirements”.